Will They Sell? - Cars! Cars! Cars! 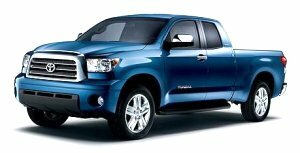 The Detroit News reports: GM ready for Toyota trucks. Yeah, yeah, yeah. We know this is a car site. But, come on, it's fun to write about the impending doom of Detroit. But we don't think this will be it. The new, mo-bigga Tundra, that is. We're very confident that Ford and GM will be able to hold onto the majority of their marketshare of full-size pick-ups. We don't yet feel that consumers have given up on Detroit's trucks. Toyota spokeswoman Denise Morrissey agreed the market will decide, but said the automaker expects to sell 200,000 Tundras next year, up from about 126,000 in 2005. Through October, Toyota has sold about 100,000 Tundras. Toyota will not sell 200,000 Tundras in 2007. That's a snap of the 2007 Toyota Tundra which, from that angle, doesn't look so bad.